BEIJING (Reuters) – China expressed anger on Wednesday after the United Nations human rights chief spoke at an award ceremony for a prominent Chinese academic jailed for life two years ago for campaigning for the rights of the Muslim Uighur people. Ilham Tohti, who is an ethnic Uighur, was selected from three finalists for the Martin Ennals Award, whose jury is composed of 10 activist groups, including Amnesty International, where Ennals was an early secretary-general. China has dismissed the award, saying Tohti’s crimes were clear. 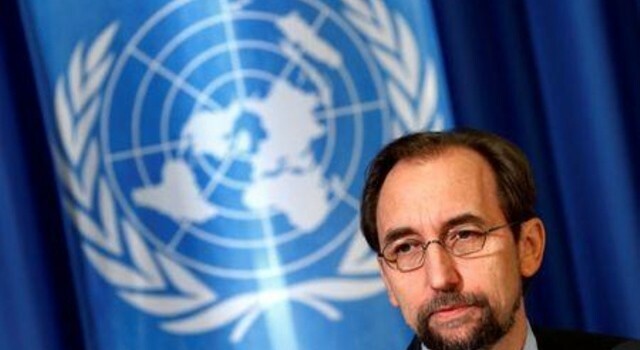 Asked about U.N. High Commissioner Zeid Ra’ad al Hussein’s attendance at the event in Geneva, Chinese Foreign Ministry spokesman Geng Shuang said Zeid had ignored the facts, confused right with wrong and “boosted the arrogance of separatists”. “This is a serious breach of the aims and principles and United Nations charter. It is an interference in China’s internal affairs,” Geng told a daily news briefing in Beijing. “Internationally, there are always certain forces who ignore the crimes committed against Chinese people by individual terrorists. Tohti is China’s most prominent advocate for the rights of Muslim Uighur people, a Turkic-speaking people. Hundreds of people have died in recent years in Xinjiang, the far western home of the Uighur people, in unrest blamed by Beijing on Islamist militants and separatists, though rights groups say the violence is more a reaction to repressive Chinese policies. Many Uighurs resent restrictions on their culture and religion and complain they are denied economic opportunities amid an influx of majority Han Chinese into Xinjiang. China frequently rejects foreign criticism of its rights record and denies any repression in Xinjiang. Rights advocates said at the time of Tohti’s sentencing after a two-day trial on separatism charges in September 2014 that it sent a clear signal the government was determined to suppress dissent.